Mercury contamination is a leading threat to U.S. lakes and estuaries. Some large-scale ecosystem studies are trying to get at the recent source of the problem: air pollution. For nearly 40 years, one experimental forest in New Hampshire has led the way for long-term, multi-disciplinary ecological research geared toward making sound environmental policy decisions. The Sabino Creek Canyon Recreation Area in Arizona is whetting visitors' interest in local hydrology with up-to-the-minute stream-flow and climate information. Meet Groundhog: a 1,600-pound autonomous robot designed to map abandoned coal mines in 3-D and save lives in the process. The geosciences must take an integrated approach to research in order to help decision-makers and society maintain a healthy planet. How one exploration geologist bucked the trend and became mayor of Denver. Geology and medicine are surprisingly and inextricably linked. The survival of ancient Peruvian societies hinged on their understanding and wise use of local mineral resources. Aerial view of Experimental Lakes Area Lake 302 located on the Precambrian Shield of northwestern Ontario, approximately 250 kilometers east of Winnipeg. 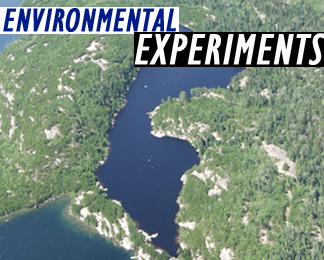 It is one of 58 small lakes that the Canadian and Ontario governments have set aside since 1968 for use in ecosystem-scale experiments and long-term monitoring. While Lake 302 was the site of eutrophication experiments in the 1970s and later for acid-rain experiments, other lakes have served as sites for research on contamination by metals, such as mercury. Read story. Photo provided by John Shearer, Experimental Lakes Area. Get your copy of the AGI Publications Catalog! E mail jr@agiweb.org for more.